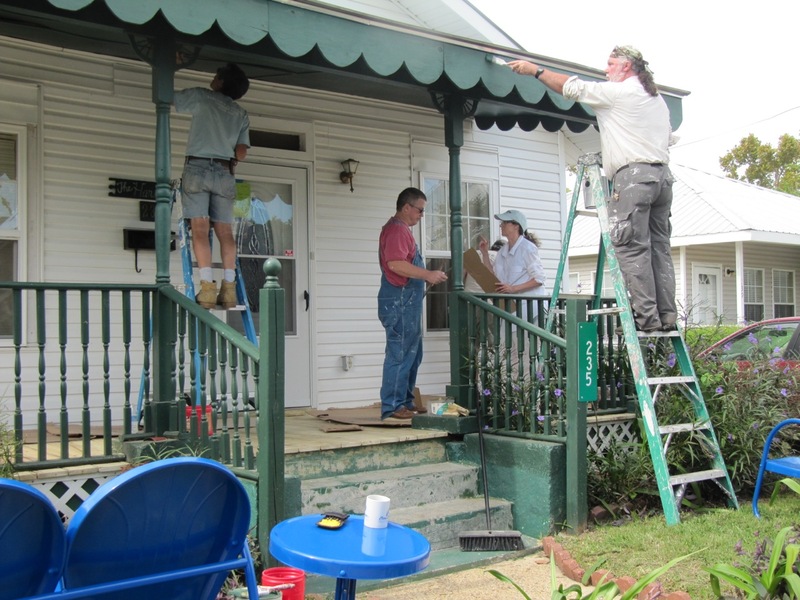 I recently participated on a mission trip to Back Bay Mission, in Biloxi Mississippi with members of my Church. When we all agreed to go on the mission trip, we knew that we would be asked to share our experiences with the congregation when we returned. So I had that in the back of my mind throughout the experience. Very early in the trip I had an experience that I knew I would be sharing. On our first morning at Back Bay, we were given a welcome and orientation talk by Craig; one of the mission staff members. It’s one of those quirks of nature that all speakers and teachers have the unique ability to pick out the least prepared member of the audience to ask a question. So Craig pointed to me and asked, “Why did you choose to come on a mission trip to Back Bay?” As I was sitting right next to Reverend Fred, I comically quipped “Because he made me!” My response got a good laugh and Craig moved on. But the question lingered in my mind and I thought about it through that day and night. Although my response was in jest, there was a lot of truth to it. I did go in part because Rev Fred “made me”. In the fifteen years I’ve been coming to this Church, through five pastors now, Rev Fred is the first to really challenge the congregation to do hands on mission work beyond our local community. Think about that for a moment. So for the first time I was challenged directly to do mission work outside of the confines of a familiar community. Now I had previously said no to trips to New Orleans, Clinton Tennessee, and Newfane New York. But last October when he again asked “Who is willing to go on a mission trip to Back Bay Mission in October 2013”, I finally said yes. So in a real way Rev Fred did make me go, and I’m grateful for that. Reverend Fred’s encouragement is only part of the answer as to why I went to Back Bay. Why did I say yes this time? After some thought the answer was obvious: because I did not have a good excuse not to go! I did not have an excuse not to go. Let me explain. From my earliest childhood I’ve known what God expects of us: “To love one another as ourselves”, “To be our brother’s keeper”, to be the “hands of Christ”. I’ve always known that I am expected to roll up my sleeves and help to the best of my ability. That was a given to me. I did not go on the mission trip to have a profound religious experience or to see Biloxi. Many people do have profound religious experiences, but my personal theology is not to expect such rewards here on earth. My “duty” is to simply do the work of Christ to the best of my ability. So to me, it came down to not having an excuse to avoid doing just that. We all have excuses not to use our hands for Christ. I’m too busy, don’t have time, I’m too old, too young, too feeble, can’t afford it, etc. But the fact of the matter is that even the least of us can do something to reach out to others and lift them up, and in so doing lift ourselves up. Going on mission trips far away is only one, perhaps more dramatic way to serve, but there are many other ways to serve right here in our local community. Whether its writing birthday cards for members of our congregation, baking bread for the food pantry, helping in the thrift shop or signing up for StreetReach, Relay for Life, or Habitat for Humanity. The outreach committee has been working for some time to expand on the wonderful work this Church already does, to develop local programs like winter soup, thanksgiving dinner, the Giving Tree, Youth StreetReach, Relay for life, and Habitat for Humanity. We’ve also sought to do more on regional and National levels with both youth and Adult mission trips, ranging from trips to Munson, MA, New Orleans, Clinton Tennessee, and this year Newfane New York and Biloxi Ms. I want to commend this congregation. You can be proud of the outreach and mission work that you’re Church does. One of every ten dollars that you pledge to NFCC, or give to the offering plate, goes directly to our outreach and mission efforts. Many churches can’t claim that. But you don’t stop there. Many of you have donated extra money to our Youth Mission, Adult Mission, Seminarian Support, and Emergency Relief funds. This financial support enables us to do a lot of good in the world. But as wonderful as your financial contributions are, they are not enough. We are all called to do “HANDS ON” work for Christ. Our Lord Jesus has made this very clear in his teachings. That’s where our congregation has room for some growth. Please consider how you can do more to be the hands of Christ in your daily lives and in the life of the Church. Today during coffee hour, you will have an opportunity to sign up for a variety of outreach and mission efforts. Let us know if you are interested in one or more of these efforts and would like to find out more about it. If none of these efforts are right for you, ask us what you can do. Everyone can be God’s hands in some way. What are your excuses, and more importantly, is it your time to lay them aside and roll up your sleeves for Christ? The second most memorable experience I personally had during the trip was ironically on the last day, during the Sunday Service at Central St. Matthew UCC Church in New Orleans. The Reverend Wilmer Brown gave the perfect capstone to the trip, speaking about our Christian call to do hands-on mission work, whether in our daily lives, local community and in locations unfamiliar to us. Rev. Brown read the account of Peter’s first miracle from Acts 3:1-10, where Peter and John pass by a cripple on the steps of the temple, and although they had probably passed by this beggar many times in the past, the scripture says, this time they did something different: 4“Peter looked straight at him, as did John. Then Peter said, “Look at us!” 5So the man gave them his attention, expecting to get something from them. 6Then Peter said, “Silver or gold I do not have, but what I do have I give you. In the name of Jesus Christ of Nazareth, walk.” Rev Brown then interprets this passage from a somewhat different perspective, one that only someone who has done mission work or worked with the poor might have. He starts by sharing with us his favorite scene from the movie Avitar where Neytiri says to Jake “I see you”. Rev Brown relates to us how Neytiri is not simply saying I see you physically, but I see you as a person. I see you. So here, Peter and John do something very unexpected. They stop and actually look at the beggar. They “see” him, perhaps for the first time. They see him as a person and have compassion; he’s no longer just another faceless beggar on the street. Rev Brown goes on to explain how important it is for us to “see” each other and to look at those in need with eyes of non-judgmental compassion. What a powerful experience that would be for the beggar, to be recognized as a person, let alone the healing that followed. Although Rev Brown did not speak of it, I’m sure he was aware that there is a lot of other “seeing” going on in this story. The beggar also has the opportunity to “see” his benefactors, not just as some faceless person walking briskly by and dropping a few coins in his cup; not just someone giving of his or her excess, but a person that stops and take the time to engage and show that they care. So Peter’s command “Look at Us!” has another meaning. He’s saying “See me!” I’m a person too. I don’t have money, but I care about you. And there is still more “seeing” going on in the story. What about the other bystanders who witness the act of caring? How many times have we passed by beggars without even looking, even crossed the street to avoid them? Often this is out of some vague fear, or confusion as to how we are supposed to act. Maybe we stop and fish for some coins or a dollar bill in our wallet or pocketbook, but we do so hastily, in obvious discomfort, never looking the person in the eyes or engaging in friendly talk. In my life there have been times when I’ve observed a caring person engage a homeless vagrant and strike up a conversation. It’s unusual to see someone who shows a willingness to accept a homeless person as someone of value and purposely tries to show them that they care. In those times, I’ve been envious of the Samaritan’s ability to reach out even at the risk of being rebuked or worse. Rev Brown’s sermon made me reconsider some of my own excuses. Are they going to use the money to buy alcohol or drugs? Shouldn’t they seek help in local clinics, etc? You know the excuses. But what would Jesus do? Did he say, help those who only help themselves? Did he say, make sure they use the money to buy food? Did he say, make sure they are Christians first? No. He just said, feed the hungry, heal the sick, and clothe the poor. No strings attached. So whenever you do a kindness to someone, others see and have an opportunity to learn and “see” for themselves. Finally, there is one last “see-er”. God. God sees you too. He see’s your act of kindness and it is noted. So the lifter is lifted. Going through the experiences of planning the Back Bay Mission trip, participating on the trip, and subsequently discussing the trip with all the participants, has caused me to reflect on the purpose of mission trips. As I see it there are three components: 1) serving as the hands of Christ without expectation of reward, 2) experiencing personal spiritual growth, and 3) spiritual and physical growth of the Church. To me the first is the most important. We are called as individuals and as a Church to serve as the hands of Christ and to help others in need. I add the qualifier “without expectation” because when we do things with certain expectations we can sometimes lose sight of the call to help, and at worse can do harm. Christian aid should not be accompanied by strings and conditions. Do we only help someone on the condition that they stop being a drug addict or alcoholic, or that they pull themselves up by the bootstraps and better themselves? Those are certainly things to strive for, but should not be a condition of aid. If they are hungry, feed them. If they are cold, clothe them. What happens if I have an expectation of experiencing a profound spiritual moment, but don’t? Was my effort wasted? Certainly not. Maybe I didn’t work hard enough, or didn’t try hard enough? Hogwash! Sometimes we are just called to do work. “Seek not your reward on earth, but in heaven”. Consider too, that often it is the cumulative experiences of service that lifts us, not necessarily every moment of service. Spiritual growth can come in leaps and bounds, but also in slow steady increments. So although service should be done without expectations of reward, one of the important purposes of mission work is that it helps us to grow in faith, whether with dramatic experiences, or slow, step by step growth in our relationship with God and our fellow human beings. Finally, just as we as individuals experience spiritual growth with mission, so does our Church congregation. Everyone can’t go on individual trips, but the entire congregation supports and enables the mission work. Participants in mission get a unique opportunity to get to know each other better and see each other in a different light, to become closer. Sharing experiences with the congregation lifts us all up. And getting back to the “seeing” metaphor, when the congregation sees the good work it is doing, and gets excited by that work, then others may “catch the bug” of mission work too. Churches that do exciting things are lifted up, pledges go up and the congregation grows. So what about long-distance mission trips, surely we could get more bang for our buck by just sending money? It’s true that often more can be done to help those in need in a particular setting with direct payments of money. But it’s not all just about physical aid. Meeting someone face to face and providing direct hands-on support can have a profound impact on both the giver and receiver. Someone actually cares enough to roll up their sleeves and help me? Just like Peter and John stopping to look the beggar in the eyes and engage him, it’s not just some stranger walking quickly by and throwing change in a cup. It’s someone saying “I see you” and being “seen” in return.